These fillable clear glass table lamps allow for all sorts of customization options. 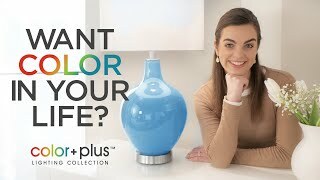 Bring fresh style to your home decor with this set of two hand-crafted glass table lamps from the Color + Plus™ lighting collection. The clear glass base can be filled to suit your personal style or home decor - from decorative accessories to themed collectibles, the possibilities are endless! Each lamp is completed by a plain white tapered shade and brushed nickel finish accents. Clear fillable glass base. Brushed nickel finish accents. 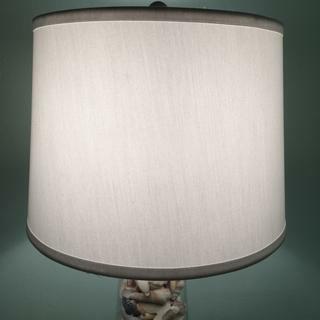 Plain white tapered drum shade. We liked the looks and the idea of being able to fill them with shells. We've collected quite a few shells over the years. This is great way to display and enjoy them. Have been looking and not finding. This is perfect. I have boxes of shells I have collected and nowhere to put them. Now I will! Does the electric cord come from the base of the base of the lamp or the top? BEST ANSWER: Hi Tara - the cord exits from the bottom of the lamp base. 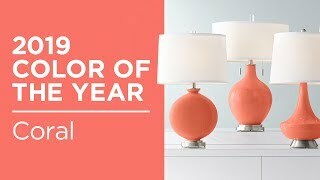 Can I remove the color insert to change a colored lamp to a clear lamp? BEST ANSWER: Hi Steve - the option you chose is with the clear glass. The other options with color are painted and cannot be removed. There wasn’t a colored insert. It was already clear. The lamp set includes a white shade and a glass, completely see-through base. 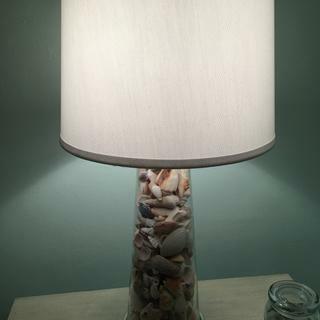 You have to put the lamp together so you put whatever (on nothing) inside the base. Do all of the colors have the option to be fillable? BEST ANSWER: Hi - the bases on the designs with color work the same as this clear version. With the color, however, anything placed inside would not be able to be seen. Simple thrilled with my purchase. I love love love my lamps. They look absolutely beautiful in my bedroom. I've been looking at these lamps for a year and I finally purchased them. I'm so glad I got them. They are big and beautiful. Just what I wanted for my night stands. I got the clear ones so I can fill them with acrylic gems and fairy lights. Great lamp. Has to be put together which is a negative but the lamp is very nice. I filled mine up with shells. Looks beautiful!